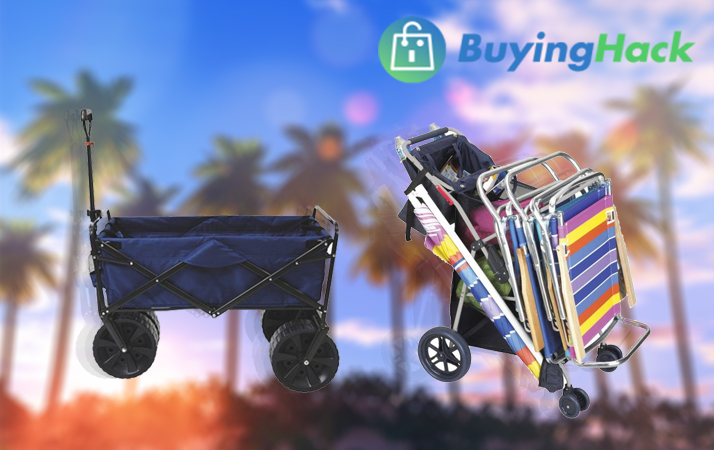 Why make multiple trips to carry your beach gear down to your favorite spot in the hot sun if you can use one our 10 best beach carts in 2019 reviewed here. Start your beach day calm and carry all your essentials in one of the carts from the cooler, towels, buckets and spades for a relaxed day in the sun. When you have loads to carry, the Wheeleez Heavy Duty Beach Cart is useful. 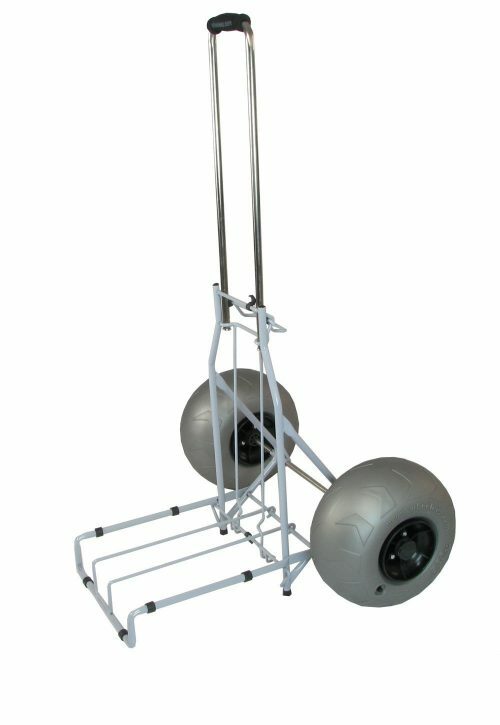 The wheels on the cart have a balloon design and move over different terrains. The wagon has a dimension of 22-inches wide and has a length of 36-inches. The wheels measure 16.5 in diameter and are 7.9-inches wide. For pulling around loads of items, the cart carries a weight of up to 220 lbs. When not in use, it collapses for storage and for keeping your items secure while pulled it has a 3.5 cubic foot tub. The tubs made of durable Polyethylene and the frame is aluminum and anodized. Included you receive a heavy-duty mesh tote bag. Nothing beats a trip to the beach for fun in the sun. However, carrying all your beach gear on the hot sand is tiresome. Solve this daunting task with the Rio Wonder Wheeler WWWC5-4670 Plus. Easily fit your 32-quart cooler box, four chairs, and umbrella on this cart. With the 8-inch wheel design, it rolls over grass and sand. The cart has a mesh bag and when you are not roaming around the beach takes it with you to the grocery store. It has a weight capacity of 75-pounds. In addition, for ease of storage fold the cart away. The frame has a steel structure and the carts dimensions are 4 x 17.3 x 29-inches and weigh 11-pounds. 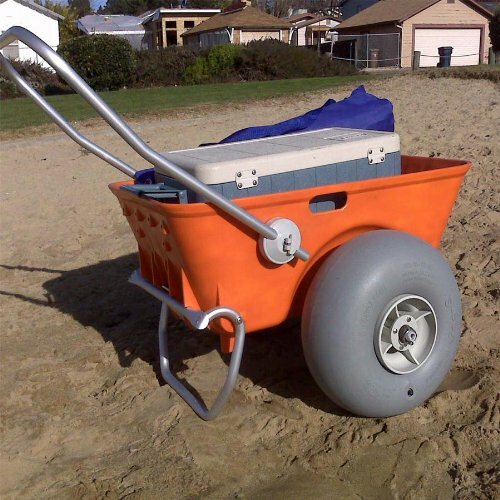 When lugging beach gear around you need the best beach cart? This is where the Tommy Bahama 2016 beach cart comes in handy. The handcart can carry up to 100-pounds of weight and has a 15 cubic foot storage compartment. You can easily place four chairs, an umbrella, and a 48-quart cooler on it. There is a dedicated umbrella holder and it pulls over sand easily. Further, it has a mesh bag for keeping important items stored away and the frame has a powder coating over the steel. 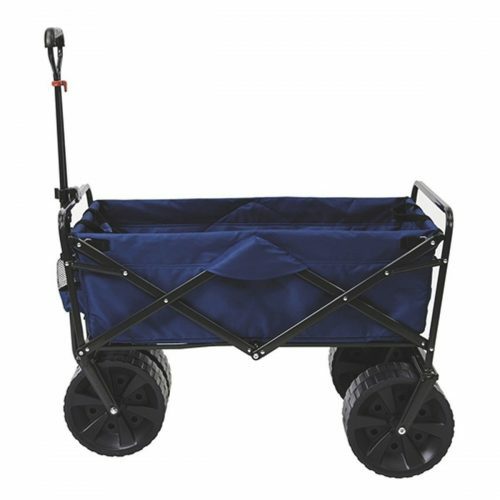 The beach carts perfect to use on all types of terrain from the garden to the beach. The tote bag you can remove for cleaning and once fully assembled it weighs 13 lbs. The tote bag has zippered side pouches and the handle of the carts cushioned. Another standout is the 10-inch rear wheels and dual steer front wheels. This Wonder Cart by Rio Beach is a great alternative to the standard wagon as it folds into a table. You can easily tote all your beach gear from the car to the beach and then set it up for your drinks and eats. On its own once unfolded, the cart is nifty and has ample space to load different items. The table dimension is 41 x 21 x 11-inches and the construction has an aluminum frame with plastic tabletop board. There are four by insulated cup holders. This is a great feature to have and prevents sand from getting in your drinks. There is an umbrella holder and you receive bungee cords to keep your items together. For one of the best beach carts that can maneuver over all types of terrain, you need the Mac Sports Folding Beach Wagon. You can use the cart to the beach, sporting events, camping and tailgate parties. The weight capacity of the wagon is 150 lbs. 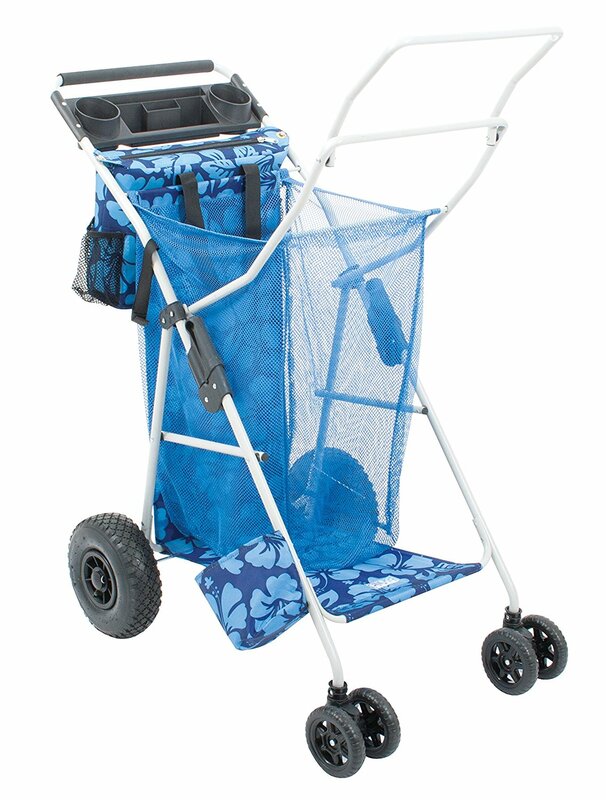 The front wheels are steerable and it has a steel frame with a 600D polyester cover that is easy to keep clean. The dimensions of the wagon when open are 36.25-inches in length by 21.5-inches wide and stand 24.5-inches high. This cart is great for kids to use and great to use in the snow as well. The wheels have a rugged design and measures 9.75-inches x 4.25-inches and you receive a one-year limited warranty. For a classic approach to pull your beach essential over sand Rio Brands have thought of everything. 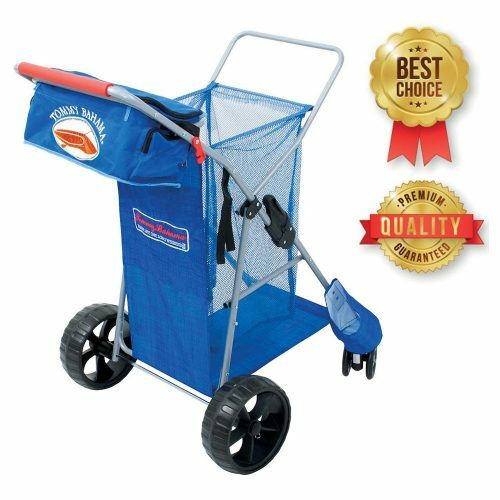 The Deluxe Wheeler is a standard cart to help you get the job done and one of the best beach carts you can buy. The cart has a 15 Cu. Ft. storage space that holds up to 100-pounds of weight. The back wheels fixed while the front wheels coherent. You have a stroller type handle with a handy neoprene grip but may not be effective for a kid to pull. The tote bag you can remove to clean and it has an umbrella holder, rack, and bottom tray. The caddy offers you enough space to load different items in it. Another exceptional thing is you can choose your favorite color from blue, blue fabric and blue print. The caddy folds with ease, has a dimension of 41-inches in length by 24.5-inches wide, and stands 32-inches high. One of the largest beach carts in the Rio Beach series is the Wonder Wheeler. 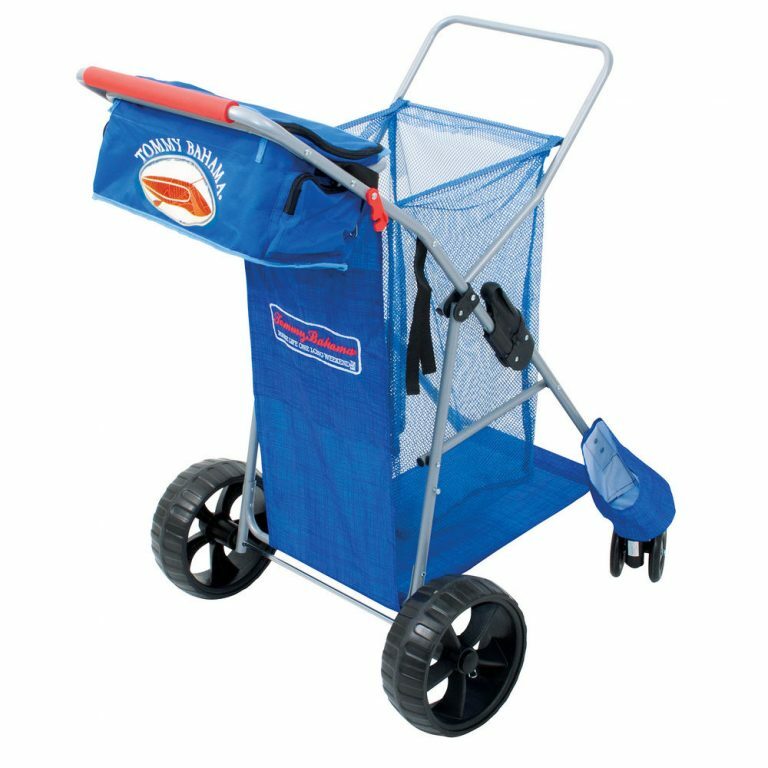 With this wide beach caddy, your day at the beach or any event will become more practical. The Rio Beach has massive 10-inch rear wheels and 4.5-inch front wheels with an extendable neoprene handle. There is a back cover with an embroidered back pocket for important items. This is an all-terrain wagon carries up to a 100-pound load and easily holds four chairs and other beach gear. There are a dedicated umbrella pouch and a large mesh pouch with a bottom tray and rack. The other great thing is it includes a tote bag but not a body board pouch. The storage area is 15 cubic feet. For a deluxe beach cart, the BeachMall Wonder Wheeler has 4-inch wheels for a smooth transition over the sand when loaded heavy to the brim. With the unique design, the caddy has a mist finish. The tubing has a gray/silver mesh cover with a durable black fabric exterior. BeachMall used the same technology you find in baby strollers and has 4-inch wide large 10-inch diameter wheels. The neoprene handles extendable and has a full width back cover with an embroidered back pocket. The platform measures 21-inches in length and is 14-inches wide. You can easily fit umbrellas, chairs and your beach gear on this wagon. With the foldable design, it helps for storage and transport, weighs 12.8 lbs, and comes fully assembled. The wheels snap on with ease and have a chair-hanging bar with a built-in holder for the umbrellas. 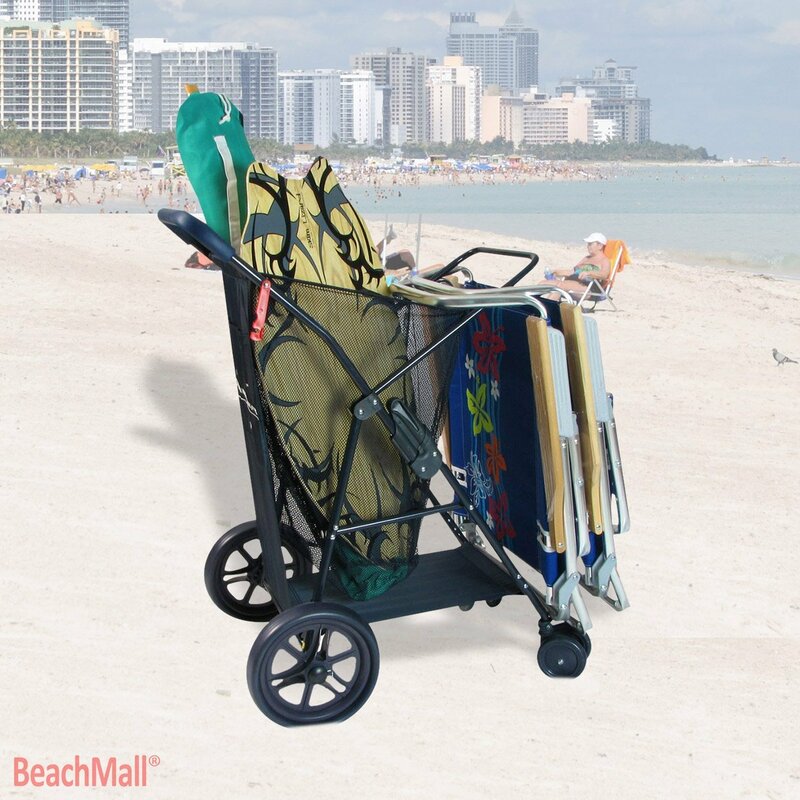 The BeachMall can hold up to four chairs and has a carry weight capacity of 77 lbs. 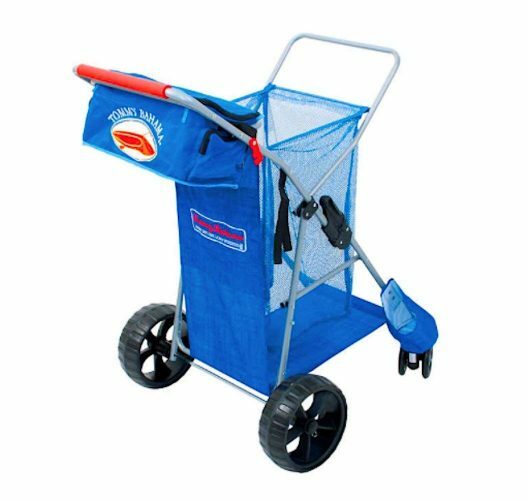 For a best seller, the Mac Sports Beach Cart has what you need to enjoy a fun day with the kids at the beach. 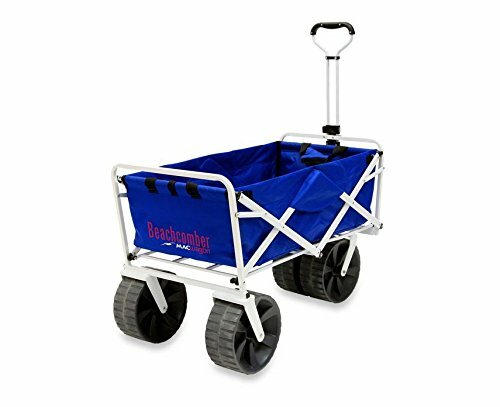 This is a heavy-duty collapsible wagon and a great option for hauling large amounts of beach gear. This wagon is 3-feet long and 2-feet wide and deep. For carrying different items, it can haul up to 150-pounds with ease. The handles, adjustable and make it possible for you to drag it over the sand. Even when the wagons heavily loaded it, rolls like a breeze over loose sand. With the storage space, you can easily cart all the necessary gear for a day at the beach. On the front of the wagon, there are 2 mesh cup holders and space for a water bottle and a couple of beers. The other great thing is you can choose your color preference from a wide selection of shades. 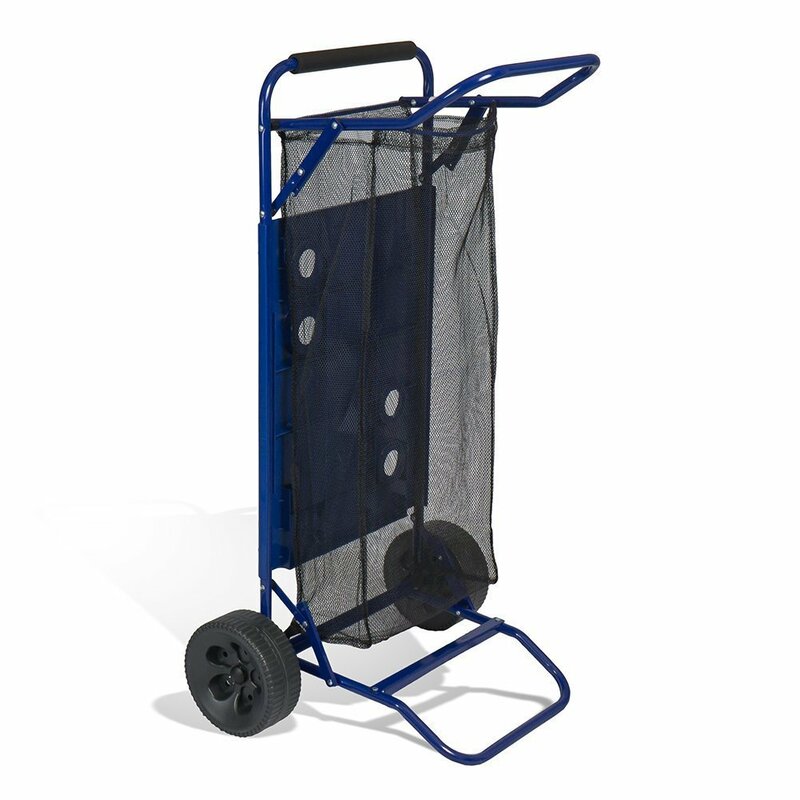 The cart is durable, made from 600 Denier Polyester fabrics, and needs no assembly. Using beach carts is a great way to transport your camping gear from the parking lot to the sandy beach if it is a long way to walk. These handcarts have unique designs suitable for ease of movement over sand. However, before you head out and buy one always consider the type of beach gear you will be hauling around with you. Make sure to choose one that has a roomy space to carry all the equipment you are planning to take with you. Another important feature is the wheels, you do not want to end up wishing you should have carried the stuff instead as the wheels are stuck in the sand. Lastly, consider buying one that easily folds away for transport and storage taking up little space once folded. Why struggle with your beach gear when planning a day out in the sun. Choose one of our top 10 best beach carts in 2019 to help you out. 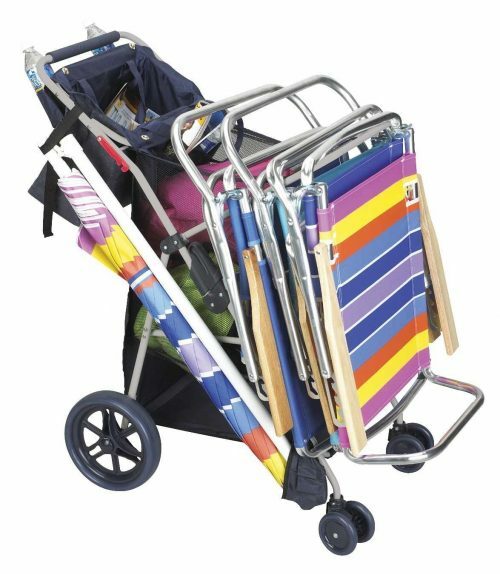 Each of the beach wagons reviewed here has ample space to carry loads of items from beach chairs, a cooler box, toys, to your umbrella. They are durable and easily folds away for storage. In fact, now there is no more fussing when hauling loads of items with you to the beach or anywhere.